Do you have a favourite cake recipe? Share it with Prim Perfect – and you can help us raise money to fight against cancer! Come for Coffee at Prim Perfect! 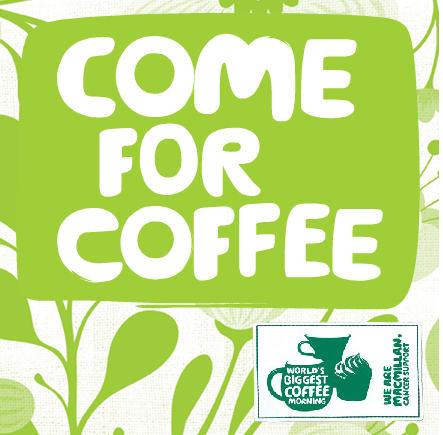 Every year the world’s biggest coffee morning is organised in the United Kingdom by Macmillan Cancer Support to raise money for its work in the fight against cancer. In 2012, 115,000 people signed up, raising nearly £15,000,000 – that’s nearly US$23,400,000. How do they raise the money with a coffee morning? The event started in 1990 when a local fundraising committee decided to hold a coffee morning where people came along to meet and mingle – as they might ordinarily do – but donate the cost of their coffee to Macmillan in the process. The idea seemed such a simple, yet effective, one that they suggested the model be taken up nationally. The first National World’s Biggest Coffee Morning was in 1991, when 2,600 people registered to hold coffee mornings across the country. Since then it has raised over £75 million in total for Macmillan Cancer Support. Prim Perfect is getting involved too! This year, the World’s Biggest Coffee is on September 27th 2013 – and Prim Perfect will be holding a special coffee morning at our Headquarters to raise money for the event. The event will be held at Pointe LaRue Isle from 11am to 3pm SLT – and along with cake and coffee, there will be music to dance to as well! 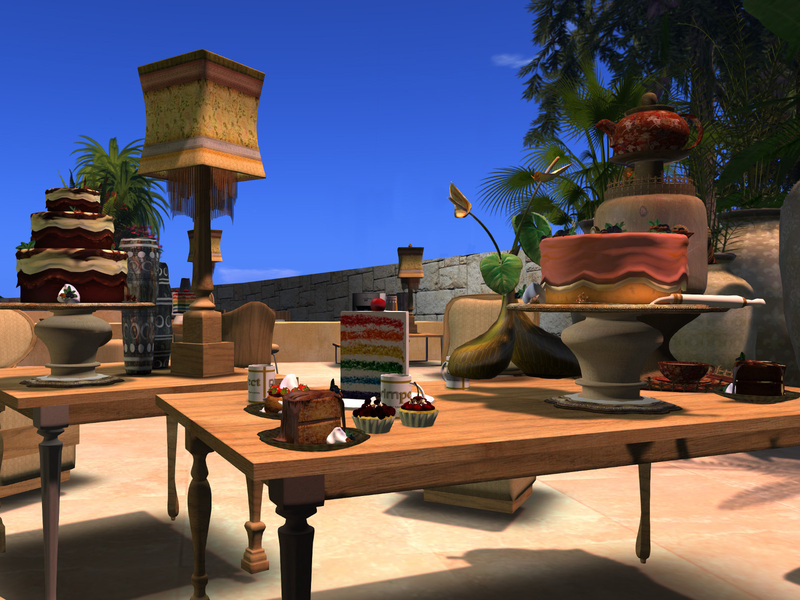 How do you hold a coffee morning in a virtual world? Well, we will be selling slices of cake… but when you buy a slice, in addition to the slice of virtual cake, you will also get a real recipe – so you can make the cake in your First Life and enjoy it with family and friends. 1. You can come to the coffee morning and buy some cake! 2. You can make a cake, add your favourite recipe, and send it (full perms) to Zadira Barzane, who will be putting them out on offer for the coffee morning. 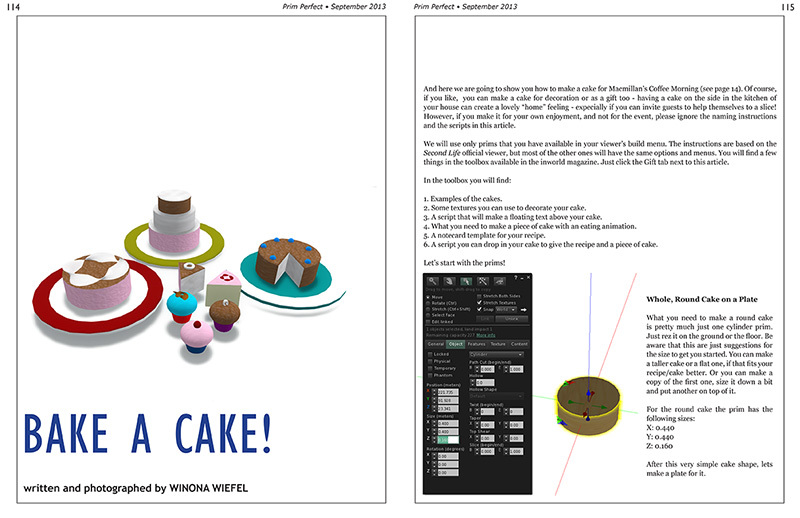 If you are not an experienced builder, there are instruction how to make simple cakes on Page 114 of the latest issue of Prim Perfect – and the inworld issue has a free giveaway toolbox to help you! Make a Cake Against Cancer! 3. Or you can send your recipe to Zadira Barzane inworld or at zadira.barzane@gmail.com – and we will bake a cake for you! 3. You can host your own coffee morning anywhere on the grid – and send the money to our Just Giving page. This money will be registered (so we can see how much we raise through the coffee morning) and will be sent securely and directly to Macmillan Cancer Support. On the grid, all the money from cakes and donations will go to an avatar we have created especially for the event – Macmillan CoffeeMorning (with a registered name of CoffeeMorning Resident). Dousa Dragonash and Metaverse TV are also organising an event that will go on over the whole weekend – we’ll have more on that shortly! Macmillan Cancer Support do have an office inworld which opened in 2007 (not 2008, as this article states): http://www.civilsociety.co.uk/fundraising/news/content/206/macmillan_launches_cancer_centre_in_second_life, and they also held a coffee morning in 2007. The site is still there – although the links to some of the materials seem to be out of date. The office is maintained by the development team that brought Macmillan inworld, but there is no longer any active engagement by Macmillan on the grid.